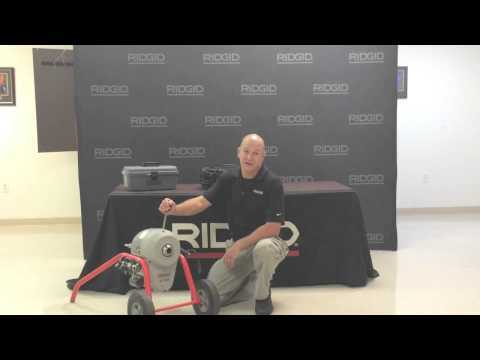 The finest all-around sewer and drain cleaning machine. One man can easily clean the heaviest blockages – indoors or out. High-speed cleaning gets the job done faster and better. Wheels to the job site – sets up fast, cleans up fast. Low-profile “B” frame design will fit most crawl spaces. Loads and unloads from truck easily. Upright “A” frame features cable carrier storage during transport, ideal for in-house applications. Equipped to run, easy to handle, 15’ (4.6 m) sections of 1 1/4" (32 mm) cable to clean 3" to 8" (76.2 m to 200 mm) lines to 200’ (61 m). Easy clutch jaw change-out adapts K-1500 to run 15’ (4.6) sections of 7/8" (22 mm) cable through 2" to 4" (50 to 100 mm) lines up to 175’ (53 m). Equipped with 3/4 HP motor. CSA approved. Approved to UL standards (NRTLC). K-1500 Sectional Machine is rated 4.6 out of 5 by 10. Rated 5 out of 5 by incognito06 from This product is easy to use and can teach to our employee easily. It is efficient and manageable for declogging in sites. Rated 5 out of 5 by victor150 from This machine is a work horse I have been using a K-1500B frame for 21 years and recently purchased a K1500A frame for the ease of transport feature for a cable carrier, we have been using it for a couple months now and each have their best usage scenario but we are an even split between the two machines now. If this machine holds up like the B frame we have then I have no doubt it will pay for itself many times over like the last machine. Rated 5 out of 5 by glenswork from Great working features I would only have a sectional machine real easy to use. Rated 5 out of 5 by rahargraves from Prefect Machine for those rough stoppages I had a 4" drain fully obstructed. I ran the first length with the cutter head and it went through like butter.